In this post, I am going to explain how to search and filter only the digitally signed emails or encrypted messages. By normal Outlook search we can filter emails by subject and message body, but we can't use this normal filter to search signed messages. For this case, we need to use Advanced Filter option and filter mails by its Message Class type. You can find some of Message Class types in below list. IPM.Note - Normal e-mail message. IPM.Note.SMIME.MultipartSigned - The message is clear signed. 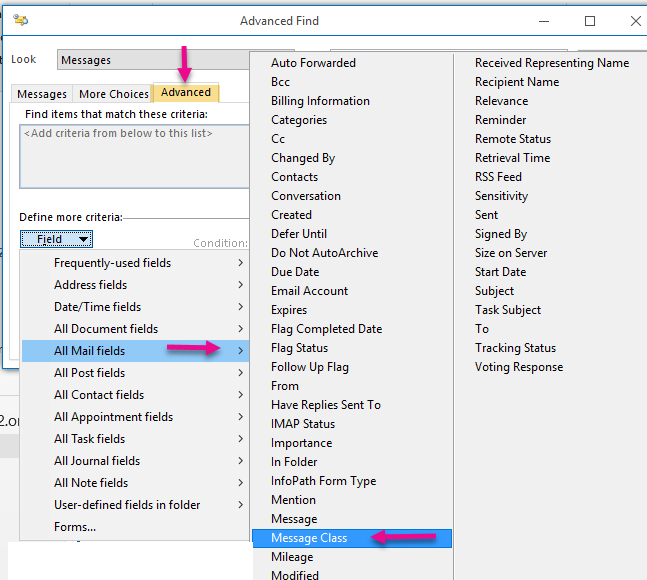 Go to Inbox (other mail folder), select Filter Email from the group Find in the Ribbon and click More Filters. Now you can see the Search tab open, select Search Tools under the group Options and click Advanced Find. 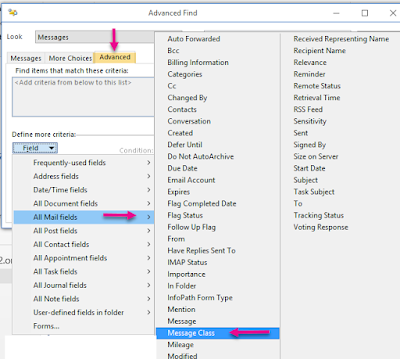 Now you can see the Advanced Find window, click the tab Advanced -> Field -> All Mail fields -> Message Class as shown in below figure. Apply the contains condition in Message Class with the value IPM.Note.SMIME to search both signed and encrypted messages. You need to apply exactly condition with the value IPM.Note.SMIME to filter only encrypted messages and apply exactly condition with the value IPM.Note.SMIME.MultipartSigned to list only signed messages that are not encrypted. Once you have added the search criteria, then click Find Now button to scan the results.